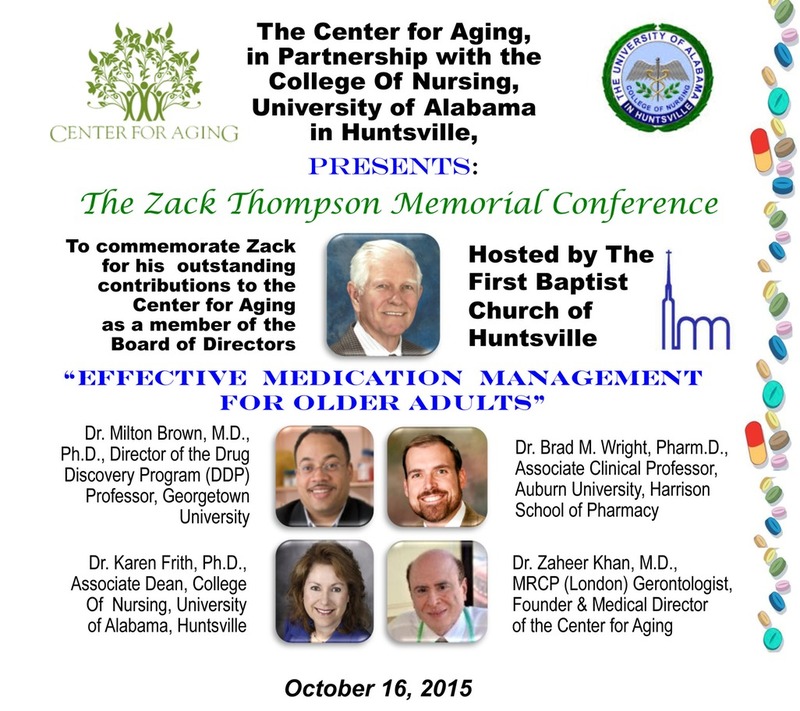 The Center for Aging Inc, in Huntsville Alabama is a nonprofit 501(c)3 community based organization. The goal of this conference was to educate our community about the interplay between aging, chronic diseases, and multiple medications. Given that the baby boomers will continue to add millions of elderly patients in an overstretched and unprepared system, it would be destructive to our society not to nurture the growth of effective medical care for the elderly. The graying of America, a triumph of medical and cultural advances, has caught us unprepared. Our healthcare system is challenged by the sheer numbers of elderly people, and the demands of providing, comprehensive, holistic, and cost-effective care. There is a need for an urgent response to this unprecedented demographic challenge. Never before in human history has our civilization had so many older adults. Currently in the U.S. there are more than 35 million people over the age of 65 and the coming years will add 77 millions baby boomers. The fastest growing segment of the total population is the “oldest-old”, those that age 80 and older. The growth rate of this segment exceeds four times the growth rate of the total population. With the expanding evidence base for medications in chronic disease management, the number of prescribed medications is increasing and this is increasing our patient’s risk of adverse drug effects (ADE), drug-drug interactions, and prescription cascade, which happens when an additional drug is given inappropriately to treat the symptoms of a side effect of the existing medications. Prescribing cascade is a situation when a patient develops an adverse drug effect from one or more existing medications. This unrecognized symptom or problem is misinterpreted as symptoms of a new disease and additional medications are perscribed. An unfortunate example of prescribing cascade occurs when patients with dementia, who are usually prescribed (Donepezil or Rivasrigmine), develop diarrhea or uninary incontiance from these medications. A cascading effcet occurs when a pill is given for these symptoms causing an anti-cholinergic effects that can lead to coma and death. Medications have saved billions of lives, cured many infectious diseases, prevented complications from chronic diseases, and treated pain and suffering towards the end of life. However, medications are like a double-edge sword and they can also cause harm, disability, suffering and death. Every year, one in three adults have one or more harmful effects from medications. In 2010, adverse drug effects caused over 1 million patient visits to the ER, many requiring hospitalization. Most often, these patients received more medications, further expanding the prescribing cascade. In one U.S. survey, 75% of patients did not inform their clinician that they were using unconventional medications. One-third of older adults in the U.S. take more than 5 prescription medications, and currently three-fourths of patients take more than one herbal vitamin or dietary supplement. This statistic is staggering and is most likely the result of older adults getting their health information from word of mouth and printed or electronic media. A vast majority of this information contains misleading marketing techniques, and subtle and gentle claims suggesting that the offered therapy could treat, prevent or cure specific medical conditions. It can be very hard to distinguish the symptoms of harmful drug effects from new or changed symptoms of an acute or chronic illness. A drug can produce one or more symptoms like any other insult to the body, be it infectious, cancer, metabolic, organ disease or lifestyle. There are millions of dollars spent yearly on medications. It has been estimated that for every dollar spent on pharmaceuticals in nursing homes, another dollar is spent on treating the drug-induced illness. The consequences of individual interactions between the aging process, multiple chronic diseases, and the inappropriate use of medications produces additional disability in the cascade towards dysfunction, poor quality of life, and loss of graceful living. So, how do we go about changing the culture of prescribing medications in our current healthcare system? Individual education for patients and their family members at each visit is the foundation of effective medication management in older adults. Practitioners should work to make medication education exciting and accessible to patients, families, and their communities. This can be done by holding group lectures and by constantly mentoring other practitioners and healthcare providers about safe prescribing in the elderly. We, as healthcare professionals, need to prioritize medication management as a preventive strategy to promote healthy aging. We need a change in paradigm from a “Cure Model” to a “Care Model”. At this time in healthcare, we have created a healthcare service that knows neither who we are serving nor the patient as an individual. It is unsafe, and profoundly inconvenient. It is clearly an approach that is both inappropriate for the patient and unsustainable for society. Our goal is to help the community address one of the most challenging problems confronting older adults with multiple chronic medical conditions in managing multiple high risk medications. As part of our initial effort to introduce basic knowledge for the community, we have chosen a few important topics for discussion. Polypharmacy and potentially Inappropraite medications in older adults. There is a wide range of opinion regarding polypharmacy; however, poylpharmacy is more common when five or more medications are taken. Current practise guidelines often recommened multiple medications for management of each disease. Many older adults have multiple diseases and , in addition, take over the counter medications, supplements, multivitamins, minerals, herbs and natural products and they all add up to create a "pill burden”, and this can result in medications whose actual or potential harm outweighs the benifit in the elderly. International research points out that Polypharmcy has become a major worldwide problem and almost 50 % of patient’s are taking one or more medications that are not medically necessary and that potentially threatens the health and well being of an older adult. 1. Potentially serious side effects, drug-to- drug interactions and the resulting symptoms may be misjudged or misinterpreted as symptom of another disease and additional medications are prescribed resulting in the so called , “ prescribing cascade” . 2. Impaired function and declining mobility, medications affect the entire body systems and can lead to any number of symptoms that mimic disease and impairement of ability to function and perform activities of daily living and as a result curtailement of activity resulting in a further decline in mobility and self care. 3. Falls, one in three community dwelling adults over the age of 65 fall each year from multiple- and often avoidable- causes and polypharmacy remains one of the major causes of falls. 5. General decline in health with failure to thrive leading to a poor quality of life and loss of abilty to lead a graceful life. 6. Increased risk of visits to the ER with the potential to receive more medications to treat symptoms from effects or adverse effects from use of existing drugs. .
7. Increased risk of hospitalizations with exposure to additional tests, multiple physicians, more pills and leading to a cascade of dependency and discharge to a rehabilitation facility, assisted living facilty or a nursing home to be exposed to new physicians and more medications with the primary care physician out of the loop. 8. Death, polypharmacy can lead to death and existing research has shown it to be the 4th or 5th leading cause of death..
Polypharmacy is not always harmful, it is necassary and obligatory in clinically complex situations, and trying to limit the number of medications without a justification or clinical reason is not apppropriate and trying a “fewer the better” approach to drug therapy is absolutely a wrong approach. Avoiding medications with known benefits simply to minimize the number of drugs prescribed is clearly not acceptable and neither is it appropriate. Underprescrbing is as bad as overprescribing. This is positive polypharmacy and in this situation, the patient, family members. physician and pharmacist as a team have determined that multiple medications to treat multiple diseases are necessary and needed in order to help the patient and any potential benefit is greater than any harm and the team is implementing the regimen with close ongoing monitoring for improvement of outcomes or onset of negative effects and remembering that the elephant in the room is the -“PATIENT”. The elderly require multiple partners in the current health care system to improve health outcomes. With the ever expanding use of multiple medications, there is a need t0 develop a trusting partnership or relationship with the patient, family, physician and a pharmacist. An open ended and ongoing discussion among them can lead to an effective and safe medication management team. Pharmacists are experts in medications and one of the few healthcare professionals that are freindly always available, accessable and do not charge you with every advise! The aging process burdened with multiple diseases and disability and a progressive decline in physiological functions requires multiple medications to treat a myriad of symptoms , diseases, abnormal lab tests and radiological abnormalities, as well as behavioral, psychological and social problems. This is a daunting task and our health care system is unprepared to meet this challenge. Our answer is more tests and more medications. Deprescription is a process that can address some of the issues of polypharmacy. Acetylcholine , a neurotransmitter is an important chemical made in nerve cells which performs many critical neurological functions in the brain, spinal chord, and all nerves. Any medication that blocks acetylcholine has an anti-cholinergic effect. A list of over the counter medications with anti-cholinergic effects is given below. Underprescrbing is as bad as overprescrbing. A complete list of anti-Cholinergic medications is available on the Web for you to discuss with your health care professionals. We have not listed the anti- cholinergic medications that are prescribed. Dr. Mark Beer (1954-2009)was an American geriatrician, whose research on drug interactions among older adults led to the creation of a list of medications that have the potential to cause significant side effects. In fact, the treatment may potentially be worse than the initial ailment.